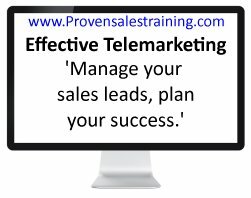 Telemarketing lead management shows you how to plan your telephone and sales succes and make your customer base grow. Manage how you acquire sales leads. Make growing your customer base a simple process. Forecast sales, appointments, and sales lead requirements. Don't leave inbound enquiries and outbound cold calling to chance. However you use telemarketing manage it professionally. As a coach, trainer, and manager I see small business owners, and sales people for large organisations, concentrating on selling and leaving the supply of sales leads to chance. Often sales lead management is not given the time and importance it deserves. I've helped people and businesss to plan for their success by focusing on telemarketing lead management. The key is making sure they have the right number of leads, of the right quaity, at the right time, for their telesales or sales appointment calls. The more effort and resource applied to lead mamagement, the easier the rest of the sales process becomes. Start with your sales targets and work backwards. Use conversion rates to forecast how many leads you will need each month. Then put your plan together for generatiing the leads. Do you want incoming enquiries or leads for outbound cold calls? Who are your target prospects? How can you bring in enquiries and cold sales leads for free using the Internet?